Only use the tip of your pick. No more than a couple of millimetres of the pick should come into contact with the string. You may want to hold the pick at a steeper angle so that only the edge comes into contact with the strings. This reduces the resistance on the pick but makes each note sound less crisp and clear. Keep your fingers, wrist and arm relaxed. Many people tense up when they try to play faster. If your shoulder or wrist aches then you're doing it wrong. Try starting slow and increasing the speed whilst maintaining the relaxed feeling in your arm. 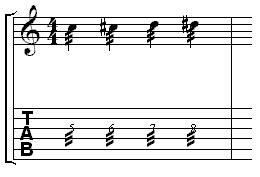 Tremolo picking is represented in tab by three diagonal lines under each number, although Internet tabs have their own notation.